Club member Kenny Shue, with the board in our showroom. 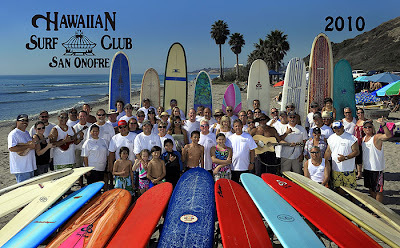 In 1990, transplanted surfers and friends from Hawai'i and California organized and formed a surfing club at San Onofre State Beach in Orange County, CA. This year denotes the club's 20th anniversary. Raymond Patterson, a well-known, soft-spoken surfer and noted ukulele virtuoso, was one of the club founders together with Kalani Akui, Frank and Helen Marasco, Alfred Kuhia, Sandy Kanaeholo, and John Loo. Now, every weekend club members, their families and friends meet at San Onofre, known for its casual and relaxed beach atmosphere, to enjoy surfing the mellow waves, the warm sunshine, ono "kanaka" food, Hawaiian music, and good times that only good friends can offer. This board belonged to club member Wayne Curtis, and was donated by his widow, Pam and the Hawaiian Surf Club. Wayne wanted to keep the board in pristine condition and only rode it a couple times. The board (shaped in 2004) is one of 60, shaped by Steve Irvin, especially for club members. 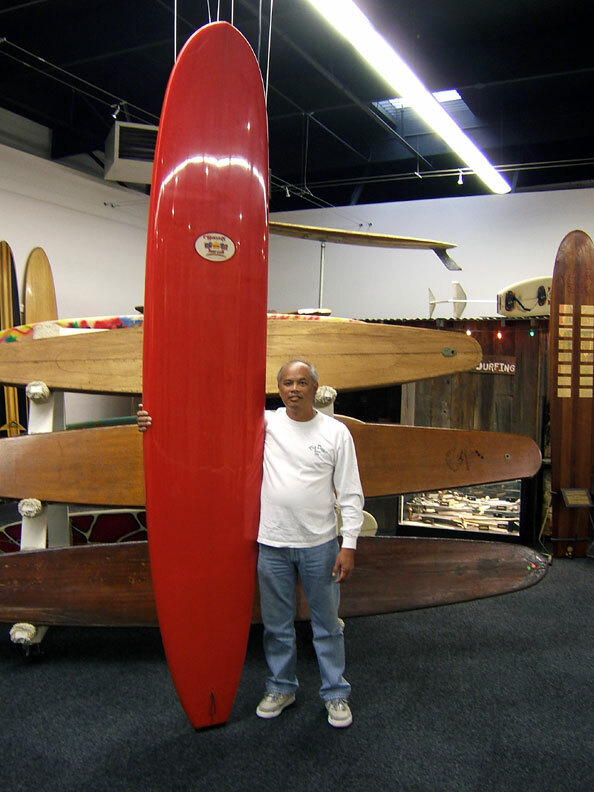 Steve along with his twin brother Stan, have been shaping boards in Southern California, since 1963.